Brought to Manila for the first time, the International Film Expo 2013 (IFX) will be held on September 6-7 (9am-6pm). It aims to develop the national film industry further into the international arena by gathering local and foreign film makers, stakeholders, services, and prominent players for possible partnerships and co-productions as well as technological and educational exchanges. The film market presents film-related products and companies in an open market slated to showcase their wares and services. The IFX also features a dedicated ASEAN corner wherein representatives of respective ASEAN countries will manage booths to showcase their countries’ works and contributions to film development. 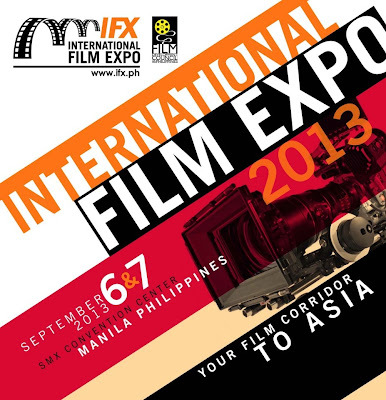 Aside from the open market, a symposium will also be held for professionals and enthusiasts alike, wherein topics covering the state of the film industries in the Philippines and abroad, the technological advancements in the field, and the promotion of film education will be discussed by prominent people within the global film industry. "YOUR FILM CORRIDOR TO ASIA"